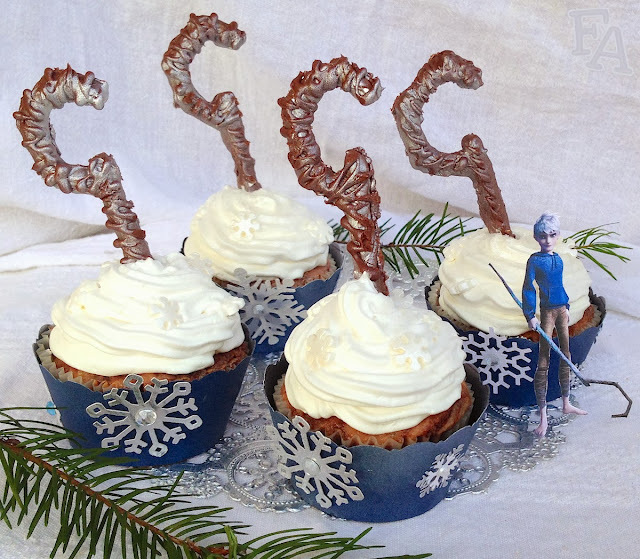 Fiction-Food Café: Jack Frost Cupcakes for "Rise of the Guardians"
Jack Frost Cupcakes for "Rise of the Guardians"
These cupcakes are inspired by the fun-loving character Jack Frost from the 2012 holiday film, "Rise of the Guardians", part of William Joyce's The Guardians of Childhood series of stories. The other characters featured in this movie each have their own origin story in book format, whereas Jack's story is conveyed through film. For more info about this movie & the Guardians book series, including my review of the film and the first book, Nicholas St. North, please click here. 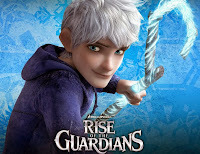 I love everything about this movie; the characters, the incredible animation—especially the movement of the characters, the action/fight scenes, and the closeups—and the themes of identity & faith explored through the storytelling & dialogue, themes centered around the immortal, magical being Jack Frost. 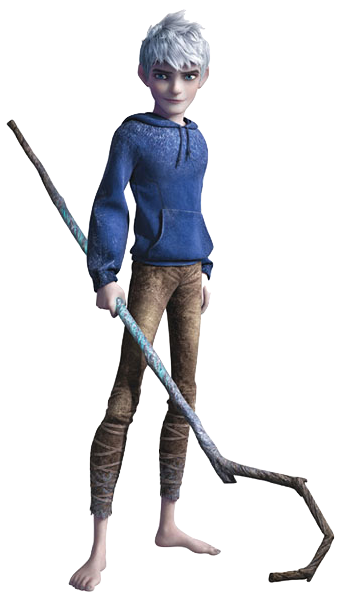 Jack has a magical staff that is the embodiment of his power, the source of which Jack must uncover as the story progresses or all is lost, including himself. 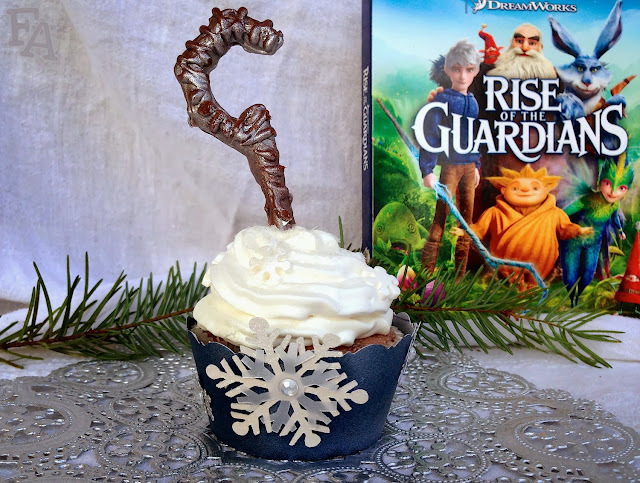 In light of the holidays, and the fact that this movie is all-hecks-of-awesome-and-you-should-totally-watch-it-or-watch-it-again, I thought I'd create this dessert to share with you so you can have a "Rise of the Guardians" viewing (party or solo) with treats! 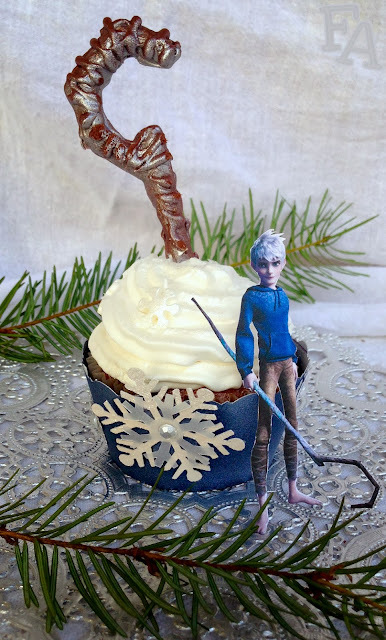 Note: The recipe for these Jack Frost inspired cupcakes is below, along with instructions for making the snowflake cupcake wrappers seen in the photos. I dropped my finished, fully decorated cupcakes, into the wrappers, but you can also wrap the cupcakes before you frost & decorate them. Choose whichever way you think will work best for you! Also, the cupcake recipe is a modified box mix recipe that makes very moist and fluffy cakes, but you can forgo all of that and simply use the white cake mix and make it as directed, substituting prepared hot chocolate in place of the plain water (same amount). I didn't use chocolate cake mix in the recipe because then it would simply be chocolate cake and not cake with hot chocolate! 1. Cupcakes: Heat your oven to 350 F & place the cupcake liners into your cupcake pan. 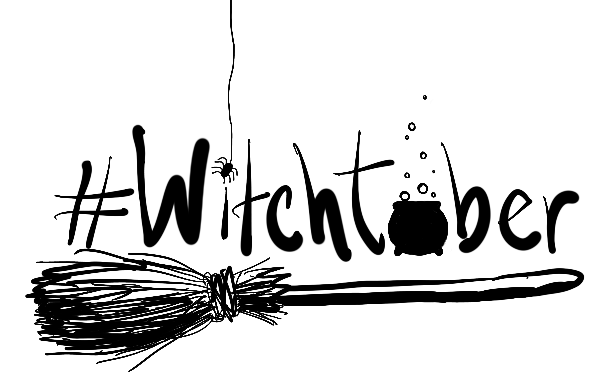 Sift together the 1st 4 ingredients, plus the optional nutmeg, into a large mixing bowl. Heat the cup of water in the microwave for about a minute & whisk in the hot chocolate powder until it's dissolved. Pour the hot chocolate into a medium bowl & whisk in the eggs, oil, sour cream, & flavoring until the sour cream is completely dissolved. Pour this mixture into the large bowl with the dry ingredients & mix it all together until it's fully incorporated & no lumps remain. 2. Heat 1 cup of chocolate chips in the microwave by heating it for 30 seconds, stirring, heating it for 30 more seconds, & then stirring it completely until it's all melted. Swirl the melted chocolate into the cupcake batter by pouring it in & then folding it over with a spatula only a few times (don't stir it so it blends in!). Fill each cupcake liner about 3/4 full & bake for about 15 minutes or until a toothpick inserted into the center comes out clean. Let the cupcakes cool completely before frosting. Continue making cupcakes until your batter is all gone! 3. 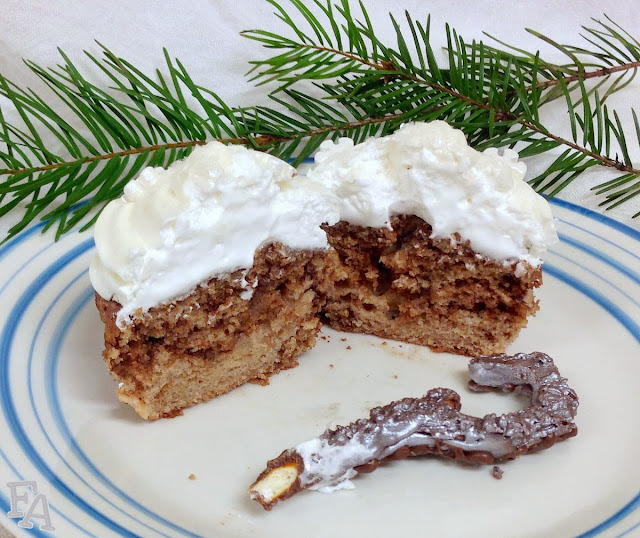 Frosting: Whip up some marshmallow fluff frosting (which is what I used) or some whipped cream frosting—whatever sounds good to you with hot chocolate! Put the frosting into a frosting bag with a large starburst tip (or just a big circle is fine) & frost those babies up! Decorate the frosting using snowflake sprinkles & edible spray (or don't use the spray on the frosting & use it only on the chocolate pretzel staffs, either way is fine). helpful) & place as many pretzel sticks onto the tray as you have cupcakes. Break several other pretzel sticks into 3/8" - 1/2" pieces, you'll need 4 for each staff (plus the whole stick). Melt 1 cup of chocolate chips in a bowl (microwaving & stirring at 30 second intervals) candy bag or candy bottle (microwaving at 30 second intervals) & then use the melted chocolate to connect the pretzel pieces together in the shape shown right. Once the pieces are chocolated together into staff shapes, coat the upward facing side of each staff in chocolate. Use a toothpick to spread the chocolate over the exposed pretzel surfaces & to create some wood lines in the chocolate. Put the staff tray into the freezer for a few minutes so the chocolate can harden more quickly. Remove the tray from the freezer & gently peel the staffs off the parchment paper & turn them over (if your hands have too much heat, run them under cold water & then dry them before you handle the staffs). Repeat the chocolate covering & hardening process. 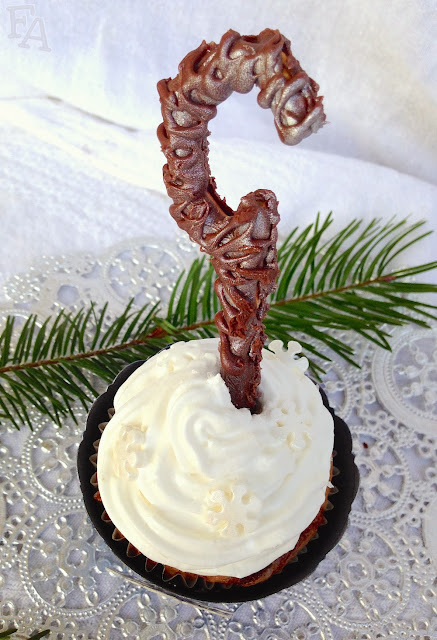 Spray the finished chocolate staffs with silver or pearl edible spray & then carefully stick them into each cupcake. 1. 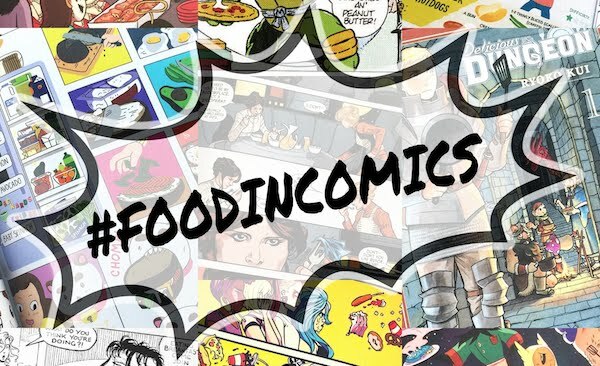 Print the cupcake wrapper template (fit image to page; it's actual size) & then cut it out. Lay the template onto the backside of 1 sheet of scrapbook paper, close to the edge, & trace. Trace several more templates onto the paper (you can get abt 6) & then cut them all out, preferably using pattern edge scissors (or edge puncher) for the upper edge. Decorate the wrappers on the topside of the paper by putting on snowflake stickers or punching little snowflake shaped holes with a special punch. 2. At one end of each wrapper, on the backside, place a piece of double-sided tape. To get the wrappers sized right for each cupcake, work with one wrapper at a time & hold it up to a cupcake. Wrap the ends around the cupcake until they meet, forming a cup shape, making sure the outer end is the one with the double-sided tape. Mark the right measurement with your fingers & remove the wrapper from the cupcake. Press the wrapper ends together with the tape & then carefully drop the cupcake into the wrapper.